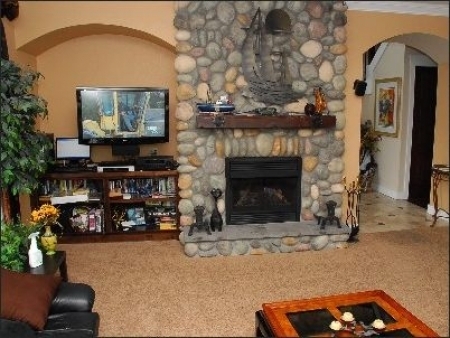 House, Five Bedrooms + Convertible beds, 3.5 baths(Sleeps 21-25). 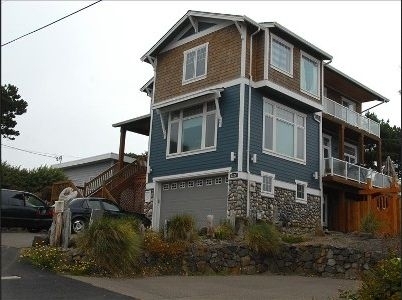 Sunset bay is 3000 Sq foot beautiful new 2007 custom built 3 Store home(1224 NW 16th st. Lincoln City 97367 - Corner 16 thand Harbor ST) gazes at the Pacific Ocean and it just a stone throw away from the local sandy beach. The hypnotic sounds of the ocean waves crashing , the salty beach air, reefs, sea lions, this and more all observed from this vacation home. Each room is uniquely well decorated in comfortable elegance. If you like beautiful artwork, this holiday home is for you. Open Great room kitchen and nook with 10 feet ceiling has breathtaking views from wall-to-wall oceanfront windows. Fully stocked gourmet kitchen(2ND FLOOR) with high-end appliances, granite slab countertops and bar, dining room with table for 8 and nook that seats 6, adjoining Great room with floor -to-ceiling stone gas fireplace, plasma TV/DVD/CD player,Home Theater system 5.1 Klipsch & Yamaha, library with over 60 DVD and hundred good books. Stepping out from the Great room to the sundeck and smelling the salty ocean breeze,Hotsring Spa For 5-6 People ,hearing the roar of the waves with the only concern of which chair you should relax in. This deck has gas BBQ grill and eating area. Upstairs (3d FLOOR)we have three bedrooms. Enter the Master Bedroom suite through the double doors and you will fall under the spell of this romantic and comfortable place. Magnificent, almost 180 degree ,ocean and beach views, king size bed, luxurious master bath. You will fall asleep to the Pacific waves with awe inspiring views of moonlight and starlight on the water, and you will wake to the stunning vista that is the majestic Pacific Ocean. The master bath is spectacular, with a jetted Jacuzzi tub, double sinks and separate walk in shower with jetted body sprays and rain head. Second Master suite with queen-bed and spectacular wall-to-wall ocean view. 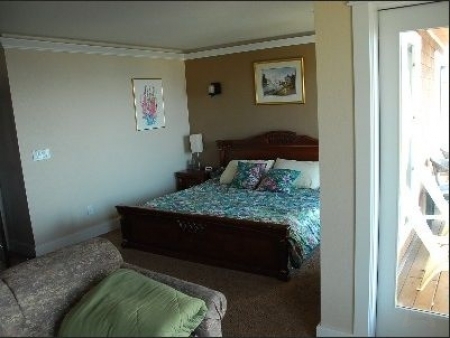 Both Masters suites have access to balcony with phenomenal beach view!!! The third bedroom has a luxurious queen bed and a twin size bunk bed. There is another upstairs full bath with shower. 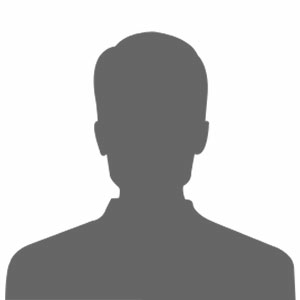 ownstairs has one bedroom and playroom . Fourth bedroom is really big. This is "the kids Dream World"-the bunk bed room, contains 5 bunk beds with tons of toys & games. All linens provided. Playroom has Air-Hockey,big 42" plasma with Nintendo Wii console and 14 games,DVD,CD,cable chanels, foosball and a lot of different games. also sofa-bed, with converts to additional full size bed. Beach access is Drive Down & Wheel Chair accessible!!! Just 50 feet away!!! It is perfect home for family reunion, classmates reunion, anniversaries, corporate travelers for local conference and any other large group up to 25, who needs to be together in one place. There is parking for 4 vehicles directly in front of house and more than plenty off street parking.